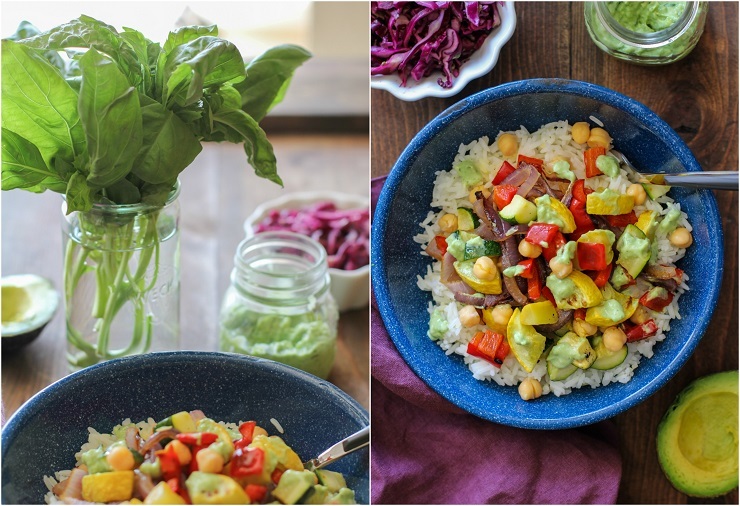 Nutritious and filling burrito bowls with roasted seasonal vegetables and avocado-basil sauce. Serve with chickpeas or black beans for a well-rounded, healthful meal! How was your weekend? Tell me the juicy deets! Saturday, man stallion and I attended a Big Lebowski-themed surprise birthday party for my friend who just turned 40 -> I was Walter and bowled a solid 71 average (<- you think I’m joking, but I’m not…what I lack in ball sport talent I make up for in the kitchen…errr…something like that). The whole party was so well played, I wish you all had been there. It was a uuuge surprise for the birthday man (organized by his wife, who did a fabulous job of organizing and keeping the whole thing under wraps), there was pizza, there were White Russians, there was a bowling ball cake, there were two Jesuses (said like Hey-Zeus-eseses), two Maudes, two Walters (myself included), one The Stranger (my own boyfriend), one The Dude, and a slew of folks who didn’t dress up but still celebrated like champ stamps. Sunday, the man cake and I hiked the tallest peak in our area, Mt. Tallac, then had post-adventure food and drinks at Chambers Landing. -> Which is why I’m a little “late” in getting this post up this morning…girl needed her beauty Z’s. SO Food! We’re going Meatless Monday here! Seasonal vegetables with rice and some form of protein (usually grilled chicken or salmon, but in this case, chickpeas) topped with a tasty homemade sauce. There is no getting sick of it, because just think of all the possibilities! – there are so many options to keep the bowl flame alive. For this particular bowl, I went the summer vegetable route and roasted up a zucchini, yellow squash, red onion, and red bell pepper. You can add, subtract, multiply, divide anything you pick up at the grocery store or farmer’s market. Just be sure you make a super stellar sauce to go with it! The avocado-basil crema, you guys…it truly is a meal maker. If you’re a mega fan of cilantro, you can replace the basil with cilantro, but I’m telling you…the avocado-basil? Magic. All I did was cook the rice and blend up the avocado-basil sauce while I was roasting the veggies. Multi-tasking like this cut down the prep time quite a bit. Because bell pepper and onion take a bit longer to roast than zucchini and yellow squash, I formed two separate roasting trays to cook the veggies and put the onion and bell pepper in first. If you like your onion and bell pepper al dente, you can 200% roast everything on the same tray for the same amount of time. It’s really a matter of personal preference. Add your favorite seasonal vegetables, such as broccoli, cauliflower, sweet potato, garlic, etc. Change up the cooking method, but either grilling or sauteing instead of roasting. Add protein of choice, such as fried (or hard-boiled) egg, grilled chicken, sauteed shrimp, etc. I bet you’re curious to see what my weekend food life looks like, aren’t ya? Filthy. Sheer.filth. 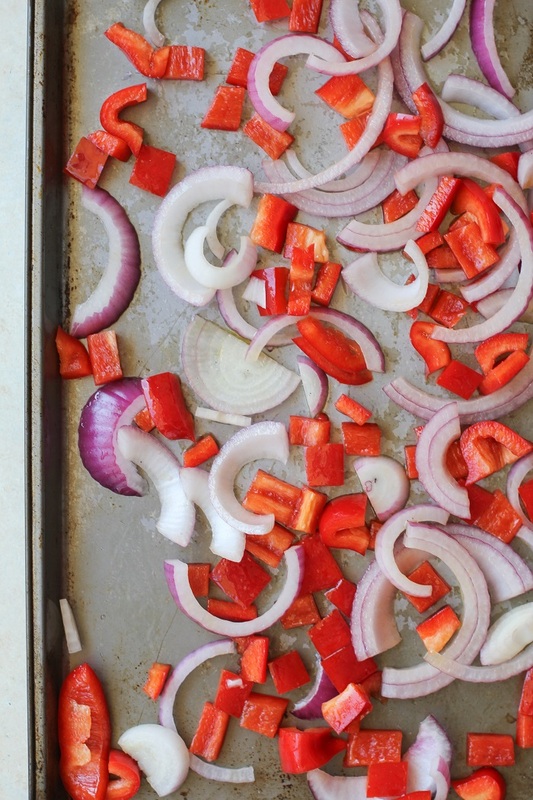 While rice is cooking, preheat the oven to 375 degrees F.
Spread the onion and red bell pepper over a baking sheet. Drizzle with 2 tablespoons of oil and sprinkle with sea salt. Use your hands to toss everything together to ensure the veggies are coated with oil. Bake for 25 to 30 minutes, turning once halfway through. 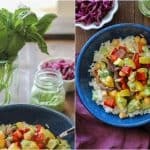 As the bell pepper and onion are baking, repeat the process with the yellow squash and zucchini by spreading the veggies on a baking sheet, drizzling with the remaining 2 tablespoons of olive oil and sprinkling with salt. Place on a separate rack in the oven and bake for 15 to 20 minutes (or until veggies have reached desired doneness), turning once halfway through. While the vegetables are roasting, prepare the avocado-basil crema. Add all of the ingredients to a small blender and blend until completely smooth. Add a small amount of water or more yogurt if needed for blending. Taste for flavor and add more lime juice and/or sea salt to taste. 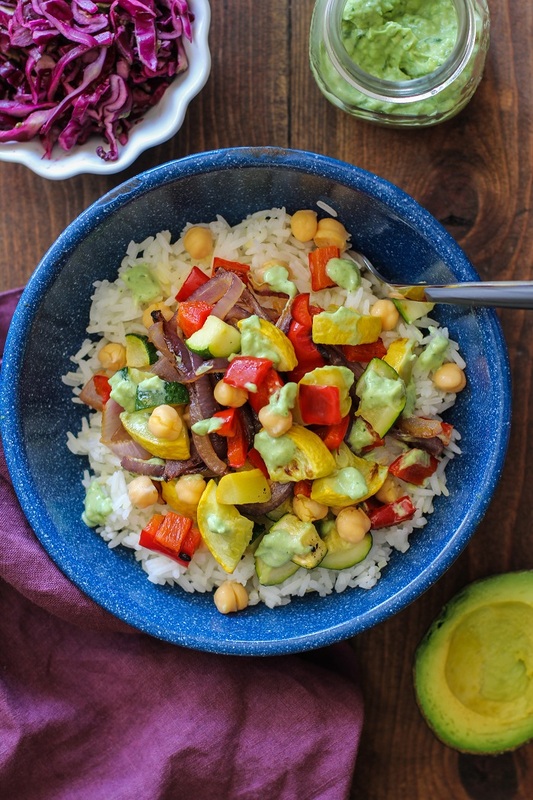 Divide the rice among 3 to 4 bowls, followed by the roasted vegetables and chickpeas. Top with avocado crema and serve. Drooling over the basil avocado sauce! These bowls look seriously perfect! Mmmm, that basil avocado crema has my mouth watering! So good! Well your weekend sounds like it was the bees knees. What a genius idea to throw a Big Lebowski birthday party!! That’s freaking hilarious. Then hiking + good food and dranks? Doesn’t get much better than that. Unless you finish Monday with one of these scrumptious bowls, of course. That avocado basil crema is LIFE. 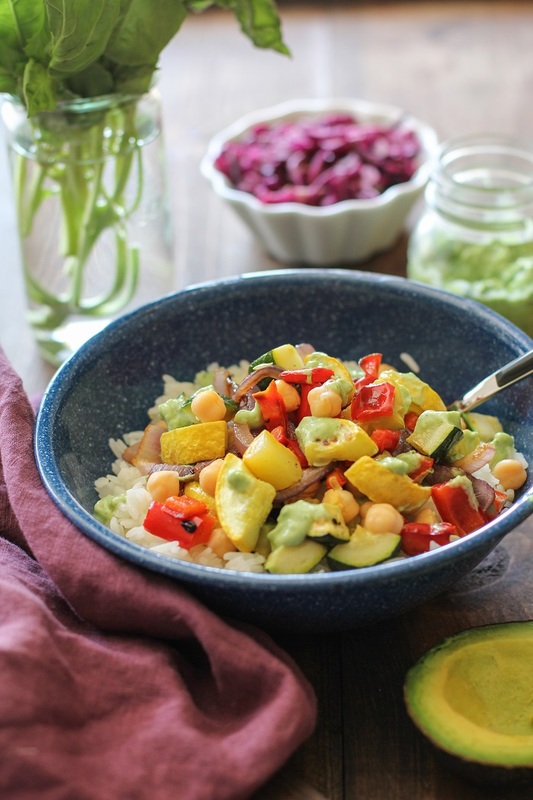 Dreamy roasted summer veggie burrito bowl. I am drooling over that basil avocado crema! Looks delicious! Just made this for lunch & my wife, daughter & Ioved it! This one’s a keeper. The sauce was awesome! I have never combined avocado & basil before. How long can the avocado basil crema be stored for? Usually avocado doesn’t have a shelf life, buton 1 plain i wasable to save it when mixed with lemon juice. Was curious if this crema can be stored similarly.